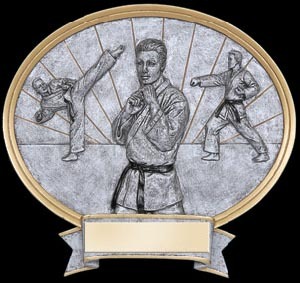 H & R Trophies' Martial Arts Award Plaques are great looking and prices are very reasonable. 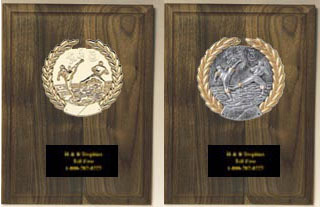 You may choose 1 of 3 plaque colors plus standard or deluxe engraving plate. You will get 40 characters of free engraving, if you need more it's only 7 cents per letter. 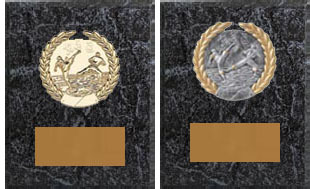 If you need Karate, Kickboxing, Judo, Tae Know Do or other Martial Arts Awards let us help you. Enjoy shopping at home knowing you will get a great product, at a great price and be convenient that you will get on time delivery. Most orders are shipped in 5 working days, rush and UPS next day air, 2nd air and 3 day select shipping available. Rush and Air Shipping Must Be Confirmed by Phone 1-800-787-8777. 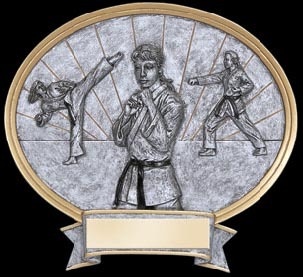 We invite you to visit each of our martial arts plaque pages below and besure to check out our other martial arts trophy award page.